In an email sent out to media this morning, Apple has announced a special media event to be held on September 12th. 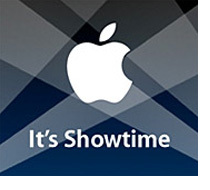 The invitation states, “It’s Showtime” along with the usual white Apple logo and sweeping Hollywood movie premiere spotlights. Apple’s special media event is scheduled for Tuesday, September 12, 10am local time at the Yerba Buena Center for the Arts Theater (http://www.ybca.org/), 700 Howard Street, San Francisco, CA. Say it with me: WIDESCREEN VIDEO iPOD with MOTION PICTURE DOWNLOADS. It’s “showtime” folks! Whatever it is, I just hope it’s about Macs rather than iPods. Anyone got a copy of the invite to post up somewhere so us mere mortals can have a look? got a battery coupon and a gift card burning a hole in my pocket. Bring on the new products Apple. I am ready. This event was one of the worst kept Apple secrets ever. Its gonna be iPod things – Its gotta be. Oh yeah, and the iPhone.